Today’s 2010 December solstice comes at 23:38 (11:38 p.m.) Universal Time today, when the sun on our sky’s dome reaches its farthest point south of the celestial equator – an imaginary line around the sky directly above the Earth’s equator. Translating Universal Time to Mountain Standard Time, that is 4:38 p.m. today. At this solstice, we celebrate the (unofficial) first day of winter in the northern hemisphere and first day of summer in the southern hemisphere. Unofficial? Yes. Winter and summer start at the solstices by tradition, not official decree. Yet, these solstices bring very real occurrences to our sky, which you can witness. In both the northern and the southern hemispheres, the December solstice brings the southernmost sunrise and the southernmost sunset of the year. If you stand in one spot night after night, week after week – for example, gazing out a window toward the sunset on the horizon – you will surely notice the sunset’s northward trek along the horizon over the coming months. From time to time, try fixing a bit of tape to the window on which you have written the date, to help you mark the sun’s passage. In the northern hemisphere, today’s southernmost sunrise and sunset ushers in the year’s shortest day and the longest night. In the southern hemisphere, it is the exact opposite. The year’s southernmost sunrise and sunset give the southern hemisphere its longest day and shortest night. Not everyplace worldwide has a sunrise and a sunset on the day of the December solstice. North of the Arctic Circle – or north of 66.5 degrees north latitude – there is no sunrise or sunset today, because the sun stays beneath the horizon all day long. South of the Antarctic Circle – at 66.5 degrees south of the equator – you will not see a sunrise or sunset either, because the sun stays above the horizon all day. To celebrate the solstice, how about looking at the planet Jupiter blazing away in your southern sky after sunset tonight? 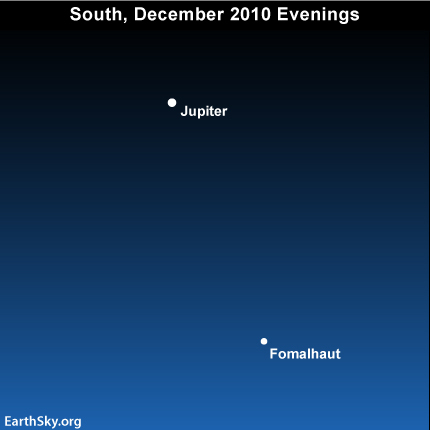 Although the solstice falls on or near December 21 every year, Jupiter’s place in the starry heavens is not fixed. At present, Jupiter lodges at the border of the constellations Aquarius and Pisces. One year from now – on the 2011 December solstice – Jupiter will be found at the border of the constellations Pisces and Aries. Site contents copyright © 2019 Recorder Online	except as noted. All rights reserved. | 88 queries in 2.330 seconds.